In addition to the Crispy Fish sandwich, which can be served on a sesame seed bun or folded in a flatbread, some locations are also offering the King's Hawaiian Fish Deluxe. 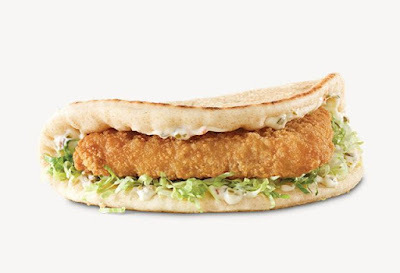 Besides the choice of bread, the Crispy Fish sandwich includes a crispy-fried, wild-caught Alaskan Pollock filet, tartar sauce, and iceberg lettuce. The King's Hawaiian Fish Deluxe features the same fish filet, tartar sauce, and lettuce but adds tomatoes, cheddar cheese, and a King's Hawaiian bun rather than a sesame seed one. Both are available for a limited time (likely through April for Lent). The suggested price for the Crispy Fish is $2.99, while the King's Hawaiian Fish Deluxe is $3.99 (may vary).